But the Warmists swore that the demon Global Warming would lead to more and more dangerous hurricanes. How rude of Nature not to play along. 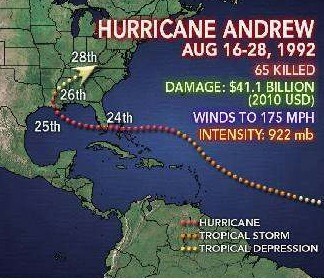 Two other category five hurricanes hit the US last century – Camille in 1969 and the Labor Day Hurricane of 1935, which was the most intense hurricane to hit the US since 1850. The US has not been hit by a major (category 3-5) hurricane in eight years, the longest such period since the Civil War. Florida has not been hit by any hurricane for eight years, by far the longest such period on record for that state. This entry was posted on Saturday, August 24th, 2013 at 14:40 and is filed under Global Warming. You can follow any responses to this entry through the RSS 2.0 feed. Both comments and pings are currently closed. 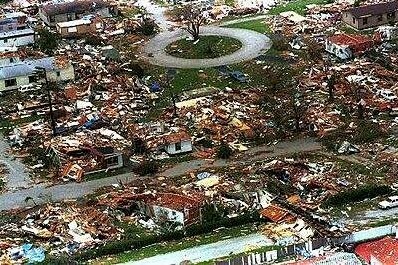 I lived in Tampa during Hurricane Andrew. I was too young to remember anything beyond sleeping in the hallway and waking up to a few fallen trees, and looking back, I probably wasn’t scared because I didn’t know what a hurricane was. That’s crazy that it was actually a Category 5. Mother Nature isn’t rude. She is very clever. It is her way to call these warmest morons.